Live imaging of the embryonic mammalian cochlea is challenging because the developmental processes at hand operate on a temporal gradient over ten days. 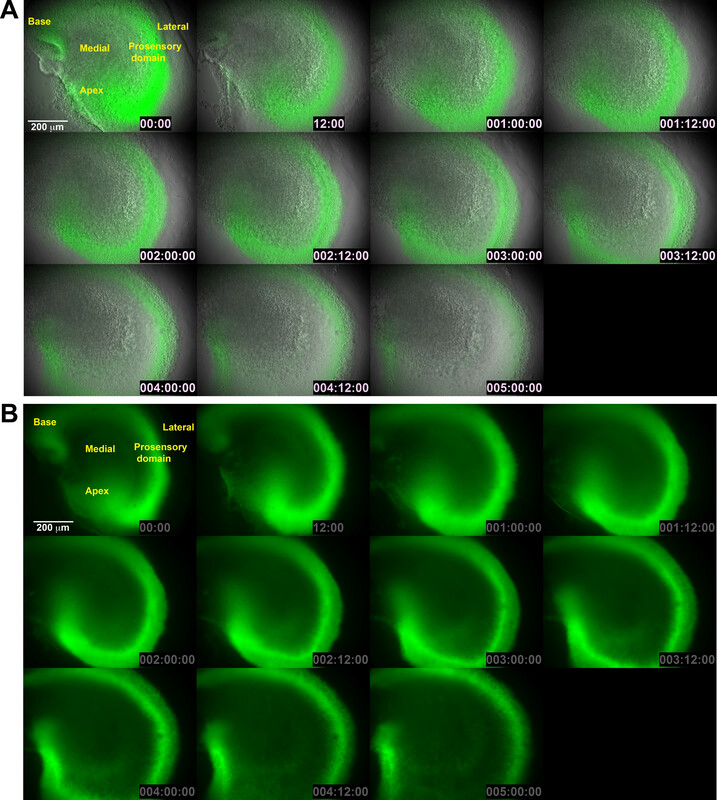 Here we present a method for culturing and then imaging embryonic cochlear explant tissue taken from a fluorescent reporter mouse over five days. Mulvaney, J. F., Dabdoub, A. Long-term Time Lapse Imaging of Mouse Cochlear Explants. J. Vis. Exp. (93), e52101, doi:10.3791/52101 (2014). Here we present a method for long-term time-lapse imaging of live embryonic mouse cochlear explants. The developmental program responsible for building the highly ordered, complex structure of the mammalian cochlea proceeds for around ten days. In order to study changes in gene expression over this period and their response to pharmaceutical or genetic manipulation, long-term imaging is necessary. Previously, live imaging has typically been limited by the viability of explanted tissue in a humidified chamber atop a standard microscope. Difficulty in maintaining optimal conditions for culture growth with regard to humidity and temperature has placed limits on the length of imaging experiments. A microscope integrated into a modified tissue culture incubator provides an excellent environment for long term-live imaging. In this method we demonstrate how to establish embryonic mouse cochlear explants and how to use an incubator microscope to conduct time lapse imaging using both bright field and fluorescent microscopy to examine the behavior of a typical embryonic day (E) 13 cochlear explant and Sox2, a marker of the prosensory cells of the cochlea, over 5 days. The mammalian cochlea is a highly ordered complex organ. In the mouse, between the emergence of the primitive inner ear from the otic vesicle on day E11 and completion of the developmental program at early postnatal stages, multiple waves of cell signaling and coordinated changes in gene expression take place. Running from base to apex of the cochlear duct is the sound detecting sensory epithelium, or organ of Corti. Development of the organ of Corti is exquisitely controlled such that by the end of development, it will consist of a single row of inner hair cells, three rows of outer hair cells interspersed with five rows of supporting cells (two rows of pillar cells, three rows of Deiters’ cells)1. Deviation from this precise order results in hearing loss, highlighting the importance of study of the genesis and patterning of the sensory epithelium2. In vitro culturing of the embryonic mouse cochlea is an essential tool in studying the mechanisms of development of the organ of Corti. This technique was established in 1974 and over the last 40 years, has been used to elucidate many of the mechanisms by which the sensory epithelium is specified and the organ of Corti established3. The cochlea is a complex organ with dynamic developmental processes; a manipulation may take as long as seven days to manifest1. For example, when adding GSK 3β inhibitors to a cochlear explant culture at E13, the optimal incubation period to observe a robust effect of the compound is six days4. Live imaging of the developing cochlea allows investigation into changes in the morphology of the organ of Corti, changes in gene expression, tracking of migrating, proliferating or dying cells, and it allows real-time observation of the results of pharmaceutical agents and disruption of signaling pathways. Until now, live imaging of the cochlea has mainly been performed using confocal microscopy to image small areas of the organ of Corti over short time periods5-8, but this technique has limitations due to explant viability. In imaging of the effects of longer-term manipulations on slow developmental processes, the imaging environment is crucial. Typically a confocal live imaging system uses a humidified plastic box that sits on the microscope. Heat and humidity can escape through the gaps in the incubating box where it meets the microscope table, through the access windows, through the hinged openings and through the gaps around various parts of the microscope- such as the objective or the light source. This is not optimal for maintaining healthy explants for more than two or three days. We define ‘incubator microscope’ as an inverted microscope sealed inside a standard CO2 incubator, rather than an incubator built around the microscope. An incubator microscope extends the life of the experiment such that rather than imaging over two or three days, samples can be imaged for up to two weeks. An incubator microscope provides an excellent environment for cell growth and differentiation, with minimal disturbance to explant cultures and standard controlled conditions. In studies that take place over multiple days it is common to resort to imaging samples on a daily basis by removing them from the incubator and carrying them to an inverted fluorescent microscope. While this approach can work, removing the dishes from the incubator inflicts stress on the sensitive developing tissue. Changes in acidity of the culturing medium and fluctuations in temperature due to removal from the incubator can result in suboptimal development and unhealthy tissue. Imaging the same region at the same focal plane and in the same orientation at every time point is extremely challenging. By using an automated system within an incubator, it is possible to maintain healthy tissue, to collect images at more time points and to ensure that the same area is captured in every frame. In recent years several integrated microscope tissue incubators have been developed, these have been useful not only in clinical practice9 but also in stem cell and cancer research10,11. Here we present a protocol for long term live imaging of embryonic mouse cochlear explants. We use an automated microscopy system inside a standard CO2 incubator that has the capability to capture images of multiple samples at set time points. The system consists of an inverted microscope set inside an incubator. Samples are placed in a rotating dais that allows imaging of multiple samples at each time point. Illumination, image capture, and rotation of the dais are controlled by an automated system operated through Metamorph software. By setting an imaging routine using the operating software we can set an experiment to run for up to two weeks with minimal human intervention. In this example we use both bright field and fluorescence to show large-scale growth and rearrangement of the cochlea, and specifically, the prosensory region. In this experiment, cochleae will be dissected from Sox2EGFP reporter mice on embryonic day E13. In vitro cultures will be established and then imaged over five days. Mouse tissue was harvested from Sox2EGFP-reporter mice12 maintained and euthanized in accordance with Canadian Council on Animal Care guidelines for the care and use of laboratory animals. Supplement Dulbecco’s Modified Eagle Medium (DMEM) by mixing 8.89 ml of DMEM, 1 ml of fetal bovine serum (FBS), 100 μl of 100x N2 supplement, and 10 μl of 10 mg/ml ciprofloxacin. Supplement Hank’s Balanced Salt Solution (HBSS) by mixing 495 ml HBSS with 5 ml of 100% HEPES. In a laminar flow hood, resuspend 200 µl basement membrane extract substrate in 5 ml DMEM. Prepare 35 mm diameter glass bottom culture dishes with 10 mm wells. Pipette 150 µl substrate/DMEM in to the center of each glass bottomed dish. These dishes can be used after 40 min incubation, or can stored in a CO2 incubator at 35 °C for at least a week. NOTE: Glass bottomed dishes are used for the following reasons: to ensure that the base of the dish is transparent and suitable for imaging, to create a well in the center of the dish that allows the explants to settle in an easily located area and finally so that after an experiment the sample can be processed for immunostaining and subsequent analysis. Turn on the laminar flow clean bench, and spray down with 70% EtOH to create a clean work space. Soak forceps, spoons, and a black 184 silicone elastomer dish (a mix of 184 silicone elastomer (10 parts), curing agent (1 part) and charcoal powder (2.5 g)) in 70% EtOH. In the clean work station, harvest embryos for the experiment. Collect embryos of the appropriate gestation in ice cold HBSS supplemented with 1% HEPES. Determine an external or visible organ that will demonstrate reporter activity and examine the embryos using a fluorescent stereo microscope. Collect the embryos that exhibit reporter activity in ice cold HBSS supplemented with 1% HEPES as these are the subject of the experiment. Working quickly, using a cool light source and fine forceps, collect the heads of the pups. Take care to clip at the cervical vertebrae and below the jaw to avoid damage to the temporal bones. Carefully open the skull. Remove the brain, trim off the front of the head, and transfer the posterior skull to fresh ice cold HBSS supplemented with 1% HEPES in a clean dish. Carefully dissect out the peanut shaped temporal bones taking care to keep the vestibular system in tact. Transfer the temporal bones to a black silicone elastomer coated dish in ice cold HBSS supplemented with 1% HEPES, pin the vestibular region of the bone. Insert insect pins at an oblique angle in order to stabilize the temporal bone and create room for the forceps. Pinning is a crucial step in the process as if the temporal bone is allowed to move too much it is very difficult to harvest an intact cochlea. Carefully remove the cartilage surrounding the cochlea. Insert one tine of the forceps into the cartilage at the outer edge of the base of the cochlea and clip a hole into the cartilage. Clip a flap up the side, insert the tine of the forceps and gently separate the roof of the duct from the cartilage. Clip horizontally across the top and diagonally, and carefully lift off the front section of the capsule. Insert a prong of the forceps in between the remaining cartilage and the duct and gently clip off the last section. The apical surface of the cochlea is now exposed. Starting at the base, catch the area where the roof of the duct meets the cochlear epithelium and open the cochlear duct. Gently peel off the roof, trimming when necessary until it is completely removed. Trim off any portions of membrane left on the medial side of the duct. Clean the duct of excess mesenchymal tissue and detach the duct from the vestibular system. Place an explant, luminal surface up, in the center of a substrate coated glass bottom culture dish, carefully draw off all of the liquid and leave for two minutes. Add 150 µl supplemented DMEM drop-wise to the explant, taking care not to disturb it. Should the explant float free, reposition with forceps, but take care that the explant settles to the bottom of the dish so that it can attach to the substrate. Place the glass bottom dishes in a deep 12 cm diameter Petri dish, with a small dish of sterile water to maintain humidity. Put the cultures in to a 35 °C incubator overnight in order for the explant to attach to the substrate and flatten. Select explant samples. Use a fluorescent stereo microscope to evaluate the condition of each explanted cochlea. Only select explants where the duct is intact and attached to the glass from base to apex. Gently aspirate off the supplemented DMEM and replace with at least 500 μl fresh media. For imaging up to 6 days, 1-1.5 ml is better. In cases where explants are loosely attached, pipette a ring of media around the edge of the dish. This extra liquid will make a miniature ‘humidified chamber’ without disturbing the explant while it continues to attach to the matrix. Alternatively, use hinged dish covers to open the lids while the dish stays in its fitting in the microscope if reagents need to be exchanged during intervals between image collections. Hinged dish covers allow the lids to be opened without disturbing the samples or removing the dishes from their settings. This maintains their exact position for subsequent image captures. Insert the glass bottom dishes containing appropriate samples into the sample dish holder. The microscope in this example has a rotating platform that holds eight 35 mm sample dishes. Under the laminar flow hood replace the plastic lids with glass lids and insert the dishes into the sample dish holder. Place the sample dish holder inside the incubator taking care not to dislodge the explants from the bottom of the dish or to disturb the media. Switch on the microscope, UV lamp and camera and open the imaging software. Locate the samples, pick an imaging area, plane of focus and adjust exposure times for each dish in sequence. Choose the plane of focus depending not only on the view of the explant at the time of starting, but also bearing in mind how the tissue will move and how long the time course will run. Set a Z stack centering around the selected focal plane in the fluorescence channel. Set the frequency and length of the sampling for the experiment. The frequency of sampling will be limited by the time it takes to collect images, so this should be determined after selecting fields of view and setting a Z stack. In this case sampling takes place every 30 min over five days. The duration of the experiment can be up to 14 days. At the end of the time lapse period open the image files. In this case Metamorph software that opens sequential collection points is used. Frame by frame pick the best focal plane for showing the cell population of interest. Convert these images to an .avi file, or export them as a montage to generate a set of images that can be opened and analyzed in image processing software or converted to multiple formats using video processing software. Here we show a montage (Figure 1) and a movie (Figure 2) demonstrating how a typical organotypic cochlear explant will grow if plated on E13.5. A Sox2 reporter mouse was used to visualize the prosensory region. The movie illustrates that the cochlea undergoes growth and convergence and extension, the cells in the lateral region of the green Sox2 domain do not seem to divide as the tissue surrounding it expands. This is a characteristic of the organ of Corti; on E13 the prospective sensory epithelium exits the cell cycle and is subsequently known as the zone of non-proliferation13. A second time-lapse experiment centering on the mid base of a different cochlear explant (Figures 3 and 4) demonstrates that as it extends, the prosensory region narrows. Note that after three days in culture the tissue has flattened considerably such that it is possible to visualize individual fluorescing cells, whereas at the beginning there are regions where internal reflection of the light due to tissue thickness make it possible to identify regions of expression but not individual cells. 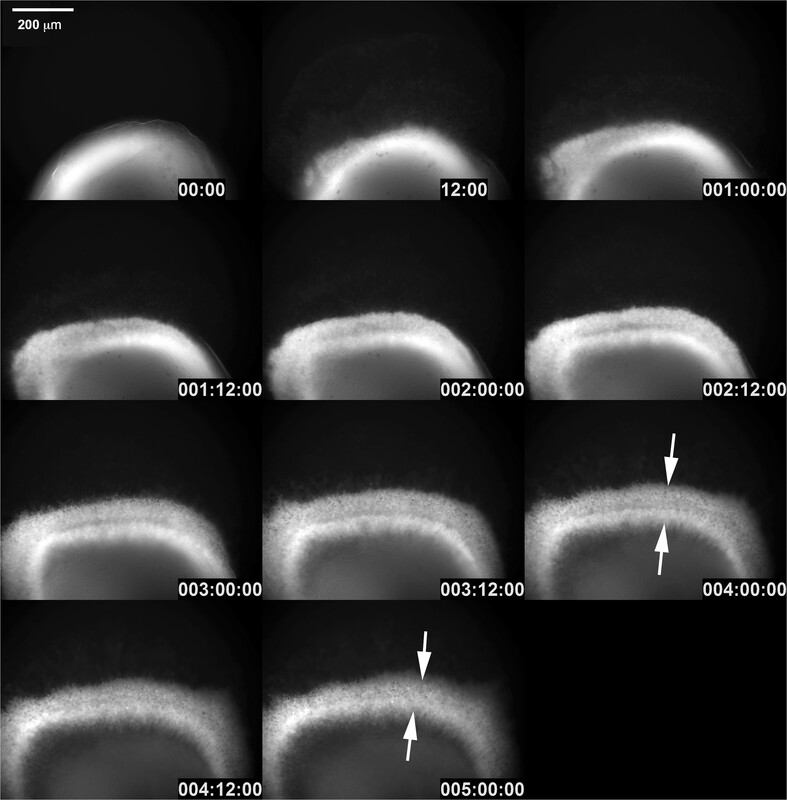 Figure 1: Time-lapse images of Sox2 reporter cochlear tissue collected over five days. This montage shows the progress of explant growth starting on day zero and ending on day five, sampling every 30 min using a 10X objective. The explant was established on E13 and cultured over night before imaging. As the explant matures it both grows and undergoes convergent extension movements. (A) Sequential images showing the extent of cochlear growth at 12 hr intervals. Visible light channel overlaid with GFP fluorescence generated by the EGFP Sox2 reporter. (B) GFP fluorescence channel only. Scale bar corresponds to 200 μm. Please click here to view a larger version of this figure. Figure 2: Time-lapse animation of Sox2 reporter cochlear tissue collected over 5 days. This is the same explant experiment indicated in Figure 1, this time frames are selected at 30 min intervals over 5 days and combined as an .avi file to generate a movie. Figure 3: Mid base undergoing CE movements and flattening. Sequential images showing that the prosensory epithelium of the mid base (EGFP) narrows, extends and flattens over the course of 5 days. Arrows indicate region that narrows. Frames selected from a 5 day time lapse sequence at 12 hr intervals using a 10X objective. Scale bar corresponds to 200 μm. Please click here to view a larger version of this figure. Figure 4: Time-lapse animation of the mid base undergoing CE movements and flattening. Animated time-lapse sequence showing convergence and extension of the sensory epithelium shown in Figure 3 with frames selected at 30 min intervals. There are several technical points to consider when cultures are established and in setting up the time-lapse microscope in order for long-term imaging. We use basement membrane matrix as a substrate for culturing cochlear explants, but the substrate should be matched to the cell type. For example, to image neuronal cultures, it may be better to provide a fibronectin coating. Incubation temperature and gas composition should also be chosen according to tissue type. Choosing the age of the explant is important. We start on E13 at the earliest because on E12 the direction of growth is less predictable. As it is essential that explants are cultured over night to attach to the substrate, experiments should be planned to begin the following day. If an experiment is to start at E15 or older, cultures should be established on E13 as over time the tissue flattens and spreads so the cells are easier to image (see Figure 3). If the organ of Corti is to be imaged, it is essential that the cochlea is dissected very carefully. Nicks in the lateral edge of the explant break the internal tension of the tissue, hence when the cochlea undergoes morphological rearrangements, cells ‘spill’ through the tear forming a ‘v’ shaped protrusion. This protrusion can move the region of interest out of view. Additionally, care must be taken to remove as much of the roof of the duct on the medial side as possible. This tissue continues to proliferate as the explant expands and can grow over the top of the region of interest obscuring it from view. When setting up the imaging routine, the growth and changes in morphology of the cochlea must be carefully considered. The objective should be chosen based not only on the size of the region to be imaged, but also taking into consideration whether that region will move or expand. Cells in the medial region of the cochlea (Figure 1 and 2) divide and move within a confined area, so a high magnification can be used (20X, 40X, 60X). Cells in the organ of Corti or the lateral epithelium, however, will move as the explant grows; a lower magnification (10X or 20X) is better, as the chances that the cells will remain in the field of view are higher. Imaging of stationary regions of the cochlea is possible at high magnifications. We chose to use a 10X objective in the representative results section because we wished to show the whole explant, and because the tissue movement is dynamic at early stages. Next to consider is the plane of focus. Given that the explant will grow outwards and flatten, it is likely that the focal plane will change dramatically over the time course. If the region of interest is the organ of Corti or lateral epithelium, anticipating this and focusing on the cells migrating out of the explant can help. This is also an argument for using the lower magnification objectives. It is possible to set Z stacks for both fluorescence and DIC. If the cells of interest are likely to move out of focus, setting up a Z stack of 3-5 µm per step can counteract this, especially if the last step is in the plane of the cover glass. It can be difficult to choose the correct plane when viewing cultures on day one, as the density of packing of the cells and reflected light from surrounding tissue can prevent a clear view. When reviewing the frames to generate a movie or montage later, careful selection of Z-planes also allows tracking of cell movements in three dimensions. The experiment can be paused at any point to adjust the focus settings if the sample moves out of range. Live imaging of a cochlear explant over a week adds a new dimension to understanding development of the cochlea that will complement confocal live imaging. This is an excellent method to use when organ wide long-term examination is necessary, but will not replace high magnification confocal imaging for short term single cell studies. Choice of technique is dependent on the type of tissue to be imaged and the context of the experiment. This technique will allow investigators to examine spatio-temporal changes in reporter gene expression, cell proliferation and migration in real time and allow study of reporter gene response to pharmaceutical agents and viability of cells in more detail than previously possible. Basement membrane extract Corning 354230 Matrigel. Alternative similar products are available from other suppliers. Hank's balanced salt solution Gibco 14170161 Multiple brands manufacture this. Should be refidgerated before use. Glass bottom dishes MatTek P35G-0-10-C The dimensions of the dish are determined by the specifications of the imaging system. 35 mm diameter, 10mm well, number 0 coverslip fits Olympus Vivaview FL. Incubator Microscope +imaging software Olympus Contact Olympus Inverted microcope sealed inside a Co2 incubator. Vivaview FL incubator microscope with proprietry Metamorpoh imaging software. Wu, D. K., Kelley, M. W. Molecular mechanisms of inner ear development. Cold Spring Harbor perspectives in biology. 4, (2012). Shim, K. The auditory sensory epithelium: the instrument of sound perception. The international journal of biochemistry & cell biology. 38, 1827-1833 (2006). Van de Water, T., Ruben, R. J. Growth of the inner ear in organ culture. The Annals of otology, rhinology, and laryngology. 83, 1-16 (1974). Jacques, B. E., et al. A dual function for canonical Wnt/beta-catenin signaling in the developing mammalian cochlea. Development. 139, 4395-4404 (2012). Castellano-Munoz, M., Peng, A. W., Salles, F. T., Ricci, A. J. Swept field laser confocal microscopy for enhanced spatial and temporal resolution in live-cell imaging. Microscopy and microanalysis : the official journal of Microscopy. Society of America, Microbeam Analysis Society, Microscopical Society of Canada. 18, 753-760 (2012). Szarama, K. B., Gavara, N., Petralia, R. S., Chadwick, R. S., Kelley, M. W. Thyroid hormone increases fibroblast growth factor receptor expression and disrupts cell mechanics in the developing organ of corti. BMC developmental biology. 13, 6 (2013). Appler, J. M., et al. Gata3 is a critical regulator of cochlear wiring. The Journal of neuroscience : the official journal of the Society for Neuroscience. 33, 3679-3691 (2013). Wibowo, I., Pinto-Teixeira, F., Satou, C., Higashijima, S., Lopez-Schier, H. Compartmentalized Notch signaling sustains epithelial mirror symmetry. Development. 138, 1143-1152 (2011). Hashimoto, S., Kato, N., Saeki, K., Morimoto, Y. Selection of high-potential embryos by culture in poly(dimethylsiloxane) microwells and time-lapse imaging. Fertility and sterility. 97, 332-337 (2012). Matsuoka, F., et al. Morphology-based prediction of osteogenic differentiation potential of human mesenchymal stem cells. PloS one. 8, (2013). Ma, G. F., et al. et al.Transforming growth factor-beta1 and -beta2 in gastric precancer and cancer and roles in tumor-cell interactions with peripheral blood mononuclear cells in vitro. PloS one. 8, (2013). Taranova, O. V., et al. SOX2 is a dose-dependent regulator of retinal neural progenitor competence. Genes & development. 20, 1187-1202 (2006). Chen, P., Segil, N. p27(Kip1) links cell proliferation to morphogenesis in the developing organ of Corti. Development. 1581-1590 (1999).